There was a new addition to Autodesk University (AU) this year — AU Theater. AU Theater featured TED-like talks throughout the week. Each session (either 1 hour or 1.5 hours long) focused on a separate topic and presented 3-4 speakers sharing their story-first presentations. The first one I attended featured the Glen Canyon Dam. The 60-year-old Arizona Glen Canyon Dam is one of the largest concrete dams in the world. The Glen Canyon Dam is one and a half times the size of the Great Pyramid in Egypt. With its construction predating CAD, as a case study, Autodesk worked in partnership with the Bureau of Reclamation using drone and helicopter photography with ReCap to create a 3D model so that the dam's caretakers now have a more complete understanding of its design and vulnerabilities. The Bureau of Reclamation used sonar to measure the amount of sediment at the foot of the dam. The most surprising find from creating the 3D model from the scanned data was the relationship of things to one another. Though some employees had been walking those halls for 25 years, they had no appreciation for what was above and below them. Viewing the model gave them a stronger sense of where everything is. The last one I attended featured speakers from "OCTO." "Welcome everyone, I'm Shaan Hurley, a Technologist in the Office of the CTO. We have three amazing presenters for you today. 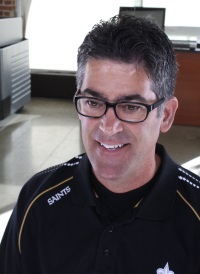 Jeff Kowalski is our Autodesk Chief Technology Officer, CTO. Jeff’s department is the Office of the CTO, affectionately known as OCTO. Our next Theater session brings together three people from OCTO. This group within Autodesk tells stories about the future and then makes them come true. The focus today is on changing technologies and how those will impact the ways we work, the ways we live, the ways we dance, and the ways that we think of ourselves in the world." With that introduction, it was on the 3 speakers. "First, please welcome Bill O’Connor, Innovation Strategist in OCTO. He’ll be discussing how advances in automation will enable us to augment our natural abilities; the potential that holds for industry and our world; and how to successfully navigate the future of work as it unfolds." Discussions about the future of work are a combination of complexity and emotions: Complexity in the number of radical emerging technologies; Emotion in the range of scenarios of great to terrible. Worrying about technology and jobs isn't new. Luddites did the same thing 200 years ago. Techno-phobia is a time-honored tradition. Make more things, better things, and with less. More: projects, products, people (jobs). Less: time, money, materials, and impact on the planet. The future of work is not a zero-sum game. It's a massive opportunity for those willing to adapt and learn. Automation can actually drive job growth. What we call generative learning, because it anticipates your needs just like generative design, can help the workers of today become the workers of tomorrow. In addition to hard skills acquired through generative learning, soft skills play a role: Empathy and emotion; collaboration and communication; beauty, aesthetics, and quality; creativity, imagination, and innovation; flexibility, adaptation, and improvisation; and finally, the meta-skill of creating great experiences for people. These are natural human capabilities that cannot be replaced by machine but augmented instead. We're in the middle of a revolution right now. Mindsets, skillsets, toolsets, have to reimagine the future of work. Whether you see it as an exciting adventure, or Valley of Dread, or both, Autodesk is committed to giving you the technologies you need to succeed in the future of work. "Next up, please welcome Tom Wujec, author, and Fellow at Autodesk. His topic is the making of THE FUTURE OF MAKING. As part of OCTO’s mission to explain the impact of emerging technologies, Tom will showcase Autodesk's most recent book, THE FUTURE OF MAKING, that shows how new tools are changing how we make things, who makes things, and the nature of what - is itself a manufactured object." Ideas — Interview 100 designers and makers, 50 thought-leaders, and representatives from 20 institutions. Organize around the process of making: Capture, Compute, Create, and Compose. Stories — Facts about the process of making are not enough. The story of making involves people plus trouble and their journey. Imagery — Images need to be vivid, inviting, and meaningful. Browse for 10 minutes and read the "pull quotes,"
Immerse for 10 hours and read every word. Production — The effect that a book should have should be visceral, substantial, and valuable. To see the results of Tom's steps, learn more about the book, and obtain a copy, check out THE FUTURE OF MAKING. "Closing this presentation is Darren Brooker, Visual Storyteller. His topic is The Future of Storytelling. Darren will be talking about how the stories we tell about the future can help us shape what happens and how we experience it. He will share how Autodesk uses storytelling to imagine and make a better world." All stories have 3 acts: beginning, middle, end. Don't share the recipe. Just tell the story. Approach your stories, as you approach your martinis — from the top down. To build reward into storytelling, make readers work. Don't supply all of the answers. Instead, let the reader deduce the answers by filling in gaps left in your stories. Successful stories feed the reader's hunger. Curiosity is a desire to close gaps. Stories open up the gaps. When it comes to stories, they are like donuts. Don't we love frosting and sprinkles on donuts? However, too much frosting and too many sprinkles, and people can no longer taste the donut. In the same way, readers can lose sight of the all-important gaps that they are working to fill. Avoid the empty calories of unnecessarily colorful layers. Ask yourself where the sweet spot is for what you want to ask of your audience? What do you want them to think, feel, and do after completing the story? Make that your ending. Provoke — If your opening doesn't provoke, the rest won't matter because nobody will be listening. Make readers curious. Influence — The middle of your story influences your audience to do what their curiosity demands. You've made them work, just enough, and your story feels like their story. You've influenced a sense of ownership. Compel — Choose your ending so it compels your audience to do what you want them to do. With this in mind, you'll never view an Autodesk executive staff presentation the same way again. Thanks, Shaan, Bill, Tom, and Darren. It was a great evening. It even included popcorn. I look forward to attending more of these at #AU2018. This is just one of the many reasons to attend AU. Start making plans now. Oration was alive in the lab.